Masked Bandit is brewed with rye, pale and Midnight Wheat malts and hopped with Bravo, Citra, Centennial and Amarillo hops. 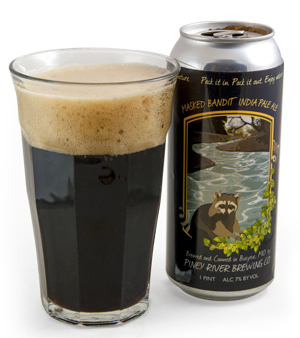 The beer name celebrates the North American raccoon. Boy howdy, that’s a dark IPA, deepest chocolate with a mocha head. You can barely see through it! Unique nose is a balance of roasted malt and aromatic hops. A complex maltiness follows through with just the right amount of spice from the hops. Wonderful with food. With this beer, we treated ourselves to wild Gulf prawns Diane (gigantic shrimp served over a rich cayenne butter and seafood sauce on basmati rice), a side of toasted Brussels sprouts, and vollkorn seeded bread. Now that’s living, Ozarks-style! It’s a stickup. If you don’t read the entire label you’re in for a surprise. It’s a black rye I“P”A. Black with a red translucence. Floral-herbal hop aroma with mild Cocoa Puff malt notes. What’s the holdup? I’m being robbed of my expectations. This beer takes you to unexpected places. Delicious, creative, unique, balanced, hoppy, with some unusual nuances that get revealed only after you’ve looked under the mask. A terrific beer worth fussing about. If you find it, try it.